The McKew Parr Collection was donated to Brandeis in 1961 by Connecticut State Senator Charles McKew Parr and his wife, Ruth. Comprised of nearly 7000 items, the McKew Parr Collection, titled “Magellan and the Age of Discovery,” was one of America’s premier private collections devoted to the era of exploration, the period from the mid-fifteenth through the mid-eighteenth centuries. Of these items, almost 1000 books and several hundred pamphlets of particular rarity and value are housed in the Robert D. Farber University Archives & Special Collections Department, while the remaining volumes, consisting mainly of mid-twentieth-century scholarly works on exploration, are held in the open stacks. McKew Parr began compiling the collection to support his research on the Portuguese explorer Ferdinand Magellan, which he eventually published in a 1953 biography entitled So Noble a Captain: The Life and Times of Ferdinand Magellan [G286.M2 P3], renamed in the second edition Ferdinand Magellan, Circumnavigator [G286.M2 P32 1964]. 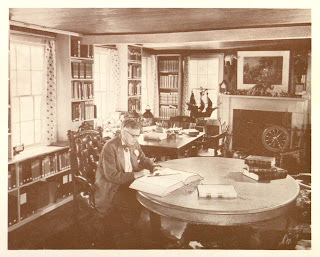 After publishing the first edition of this work, McKew Parr decided to make these materials available to the larger scholarly community, and to that end he converted an outbuilding on his Connecticut estate into a library “for the use of accredite d students and other qualified persons.” Included here are images of both the exterior and interior of the McKew Parr Library in Chester, Connecticut, the latter showing McKew Parr reading at one of the library tables. 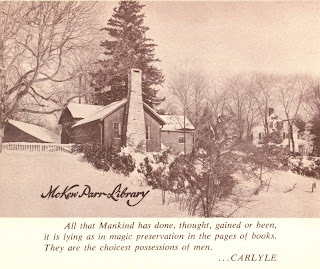 The third image shows the title page of a catalog for the library, dedicated by Charles McKew Parr to one of the other major early donors to the Brandeis Library, Mr. Bern Dibner. Materials in the M cKew Parr Collection are primarily in Spanish and Portuguese, but include some English, French, Dutch, and Latin texts as well. The collection is of primary interest to those wishing to consult contemporary accounts of European exploration and colonial history, especially that of Spain and Portugal, as well as anyone wishing to examine the treatment of these issues in early twentieth-century scholarship. McKew Parr considered these materials a working collection; that is, he gathered them primarily for their scholarly interest rather than for their rarity or monetary value, and thus, upon donating the collection to Brandeis, it was his wish that the majority of the materials be made easily accessible to students for use in their own research. To this end, the Special Collections Department is in the process of digitizing some of the more fragile items in the McKew Parr Collection through the Open Content Alliance in collaboration with the Boston Public Library. 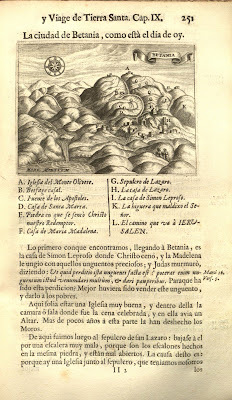 Thus far, several dozen volumes have been made publicly available in electronic format and may be viewed online at http://www.archive.org/details/opencontentalliance under the search heading “McKew Parr.” One of these texts, Noticias de Portugal, Offerecidas a el Rey N.S. Dom Ioao o IV, a seventeenth-century account of Portuguese economic conditions, has already been downloaded nearly 400 times in the eight months since it was first made available, indicating the scale of the scholarly interest in many of these items. The nearly 1000 rare items from “Magellan and the Age of Discovery” held in Special Collections include almost 300 volumes published before 1850, most of which are contemporary accounts of the process of exploration and colonization. These often first-hand descriptions of colonial encounters and the administration of European holdings abroad have proven fascinating to scholars and collectors alike and are thus extraordinarily valuable. Many of these are worthy of special mention, including the following two very fine seventeenth-century texts that illustrate different strengths in the collection. The first is the Conquista de las Islas Molucas (1609) [Rare McPar DS674 .L4 1609], written by Bartolomé Leonardo de Argensola, a Spanish historian and poet who took holy orders and was later appointed royal chaplain and historiographer of Aragon. This particular text was commissioned by the Council of the Indies to commemorate the Spanish recapture of the Moluccan Islands of Ternate and Tidore in 1606. 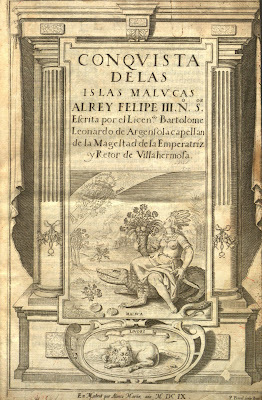 It was very well received upon its initial publication, and continues to be an important source for research into Spanish and Portuguese exploration in the East Indies, the conquest of the Philippines, and the history of the spice trade, especially since Argensola consulted numerous primary sources in the archives of the Indies when writing this work. Our volume is bound in its original brown leather over paper boards, though the spine has been rebacked in brown leather gilt and the endpapers replaced. The text itself is very finely printed, with numerous ornamental head- and tail-pieces and woodcut initials, and an especially fine engraved title page. This page, pictured below, illustrates, within a n elaborate architectural border, an allegory of the Spanish conquest of the Moluccas. The amazon queen “Maluca” is depicted seated astride a crocodile, wearing a feather headdress and holding a sword in her left hand while in her right she raises a horn of plenty filled with the fruits of her lands. Her gaze is directed upward to where a rainbow is shown containing the royal crest of Spain, shimmering in the light, signifying, with the word simul, the fact that the sun never sets on the Spanish empire. In the background is an active volcano, of which there are several on these islands, and seashells are strewn before her feet. 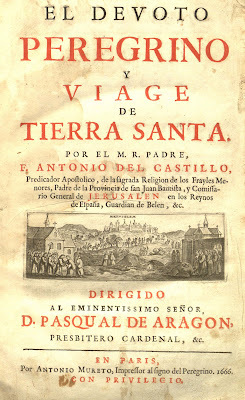 The second text is El Devoto Peregrino, y Viage de Tierra Santa, written in Spanish by Antonio del Castillo and first published in Madrid in 1654. This popular traveler’s account of a journey to the Holy Land was reissued in many later printings, including the Paris edition of 1666 held by Brandeis [Rare McPar DS106 .C35 1666]. The volume is in its original binding of quarter red leather over green marbled boards with a paper label containing a manuscript title on the spine. 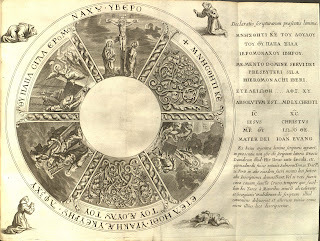 The title page includes a small vignette of Jerusalem, and there are numerous engraved head- and tail-pieces and ornamental initials throughout. 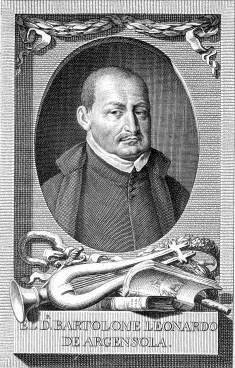 Antonio del Castillo was a Franciscan friar sent by his superiors to the Holy Land in the first part of the seventeenth century. From there he travelled to Alexandria, Egypt, and several other countries in the Middle East. In this volume, he describes his visits to Jerusalem, Nazareth, Jaffa, and the mountains and desert of Judea, with particular emphasis on the holy places he encountered there. The final portion of the book is given over to an account of the liturgy at the various important churches he visited, including the Church of the Holy Sepulcher in Jerusalem. Most striking in this volume are the numerous folded plates illustrating various aspects of the friar’s travels, particularly two enormous printed maps of Jerusalem, one representing the city as it might have looked in the first century (Descriptio Ierusalem quomodo florvit tempore D.N. 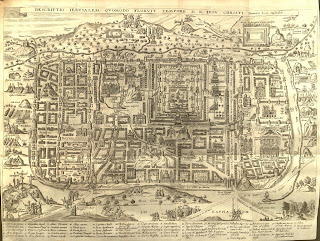 Iesu Christi [Plan of Jerusalem as it flourished in the time of our Lord Jesus Christ]), and the second portraying the city as it looked in the early seventeenth century (Novae Ierosolymae et locorum circumiacentium accurata imago [Accurate image of the new Jerusalem and of the places nearby]). Both of these maps are fascinating in their detail, with more than a hundred individual sites singled out for additional description in each instance. These include, in the first, the entire Via Dolorosa, the Way of the Cross, with all fourteen Stations of the Cross illustrated in miniature on the map, culminating in a depiction of the crucifixion and the tomb of Jesus in the bottom left corner. In the opposite corner, Judas, the disciple who betrayed Jesus, is shown hanging from a tree. In addition to such obvious Christian imagery, care was also taken to depict the Jewish character of the city in the first century. 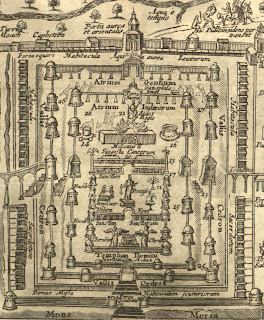 The map features, among other places, the Palatium Davidis et Regum Iude (The Palace of David and the King of the Jews), and an intricate depiction of the temple, complete with the Holy of Holies (Sanctum Sanctorum), in which the Ark of the Covenant is shown guarded by two cherubim. There are dozens of additional sites illustrated on this map, which may be seen in more detail by clicking on the image to view a larger version of the scan. 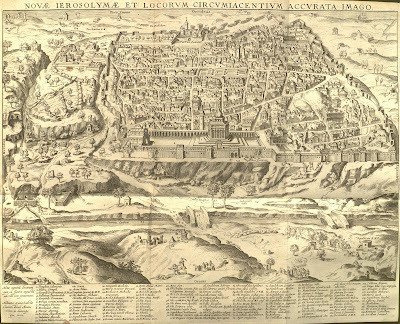 The second map (below) depicts the city from the opposite side, looking down upon Jerusalem from the Mount of Olives, which is to the east of the city. The first striking difference is the accurate depiction of the Muslim holy sites, the Dome of the Rock and the al-Aqsa Mosque, atop the Temple Mount in the center of the image. This map was likely produced from sketches of the city made from atop Mount Olivet, and thus is probably relatively accurate in its portrayal of the appearance of the city in the early seventeenth century. As in the first map of the city, numerous locations are singled out for special mention, including, for example, the Tomb of Isaiah (Isaiae Sepulchrum) to the left of the Temple Mount and Bethlehem off in the distance in the upper left of the image. Like the first map, this one may be seen in more detail by clicking on the image, which will enlarge the scan. 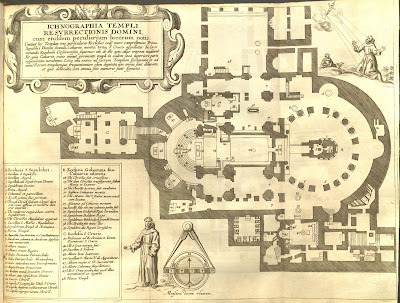 These maps are only two of the many detailed engravings in this volume, which include smaller maps and images embedded in the text, such as the below depiction of the town and surroundings of Bethany, as well as additional large folding plates with architectural depictions of important churches in and around Jerusalem, including a plan of the Church of the Holy Sepulcher, com plete with a depiction of the Stigmatization of St. Francis in the upper right corner, as the church was one of the sites administered by the Franciscans. These images also may be enlarged for closer inspection by clicking on them. 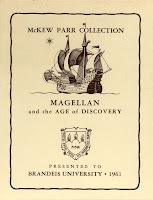 This description covers but two of the nearly 7000 volumes in the Brandeis “McKew Parr Collection: Magellan and the Age of Discovery,” which includes a vast array of resources for the scholar of colonial history and the history of Europe and European expansion in the sixteenth, seventeenth, and eighteenth centuries. Records for materials in the collection may be viewed through the LouFind electronic catalogue, and for more information, please consult the Robert D. Farber University Archives & Special Collections Department.